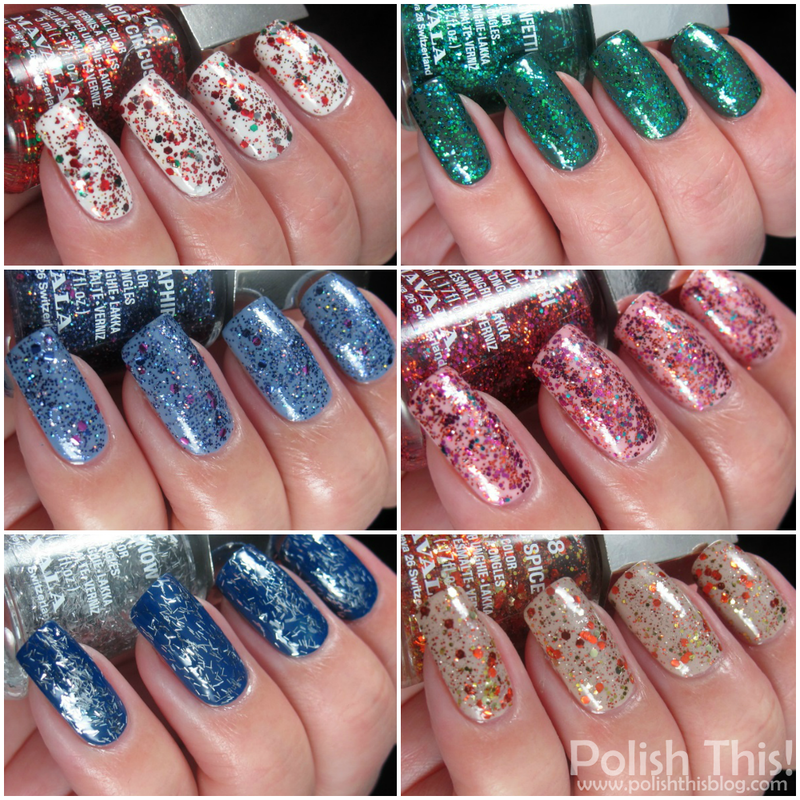 Mavala Magic Stardust Collection - Swatches and Review - Polish This! I have Mavala's new Magic Stardust collection to share with you guys today. This collection really puts you in the holiday mood already since it's a collection with six beautiful sparkly glitters. I haven't tried any polishes from Mavala for ages as I haven't really found the brand too interesting. But when I was offered these new glitters for review, I thought I should really give them a chance as they looked quite gorgeous in the promo pictures. And I'm so happy that I did, because when they arrived they looked just as gorgeous in the bottles too! I swatched these all over different base colors, though at least some of these could be really worn alone too. I wanted to show them all similarly, so I have one coat of each polish over the base color and one coat of top coat on top of the glitters. Magic Circus has all your traditional Christmas colors in the bottle. It's a beautiful mix of red, green, silver and gold. It has bigger red, green and silver hexes and tiny red and gold glitters in it and with just one coat you get quite many glitters on your nails. This isn't really anything we haven't seen before, but I still quite like it and like I said, this will be perfect for some holiday nail art. I have here Magic Circus over OPI Angel With a Leadfoot. Magic Confetti is a perfect mix of little green and turquoise glitters. This is really beautiful, I think this is my favorite one out of all these six! This looks really gorgeous over my dark grey base, but I think this would look good over many other colors too. Also this seems like a perfect glitter for some glitter gradient, I definitely need to try that. The glitter payoff in this is really good, I think this could even be worn alone with two generous coats or three coats. That way it could be used as a perfect accent nail! I have here Magic Confetti over Zoya Evvie. I have here Magic Saphir over China Glaze Fade Into Hue. Magic Sari was the one that looked most interesting to me in the bottle and this sure is a stunning mix of colors! It seems to have at least pink, orange, gold and turquoise glitters in, but there might be some other color in the mix too. It's probably the most unique one out of these six glitters, at least I don't have anything like this in my collection. This had also the best glitter payoff out of these all, so this could definitely be worn alone too with two or three coats. I have here Magic Sari over Zoya Dot. Magic Snow was the one that I was a bit afraid of - I don't like bar glitter at all. This isn't too bad, I could maybe even see myself wearing this as a part of some manicure though I would have hoped that this wouldn't have been so dense. I would like it more if you would get little bit less glitters on your nail with one coat. In addition to those thin silver bar glitters there is also some wider bars in the mix too, but I didn't get too many of those on my nails. I have here Magic Snow over China Glaze Man Hunt. Magic Spice is another favorite of mine, it's a lovely mix of gold and orange glitters in different sizes. This would have been a perfect color for Halloween nails, but I think this will work for other occasions as well. I don't own too many glitter toppers that have orange glitters in them, so this is really a welcome addition to my stash and I love the combination of gold and orange in this one. I have here Magic Spice over Essie Sand Tropez. To me this is really succesfull collection from Mavala and I'm sure there's a perfect holiday glitter polish in this collection for everybody. I personally would have changed that Magic Snow with the silver bar glitters to some other kind of glitter, but that's just me and I'm sure there are people who like it. My favorites are Magic Confetti, Magic Spice and Magic Sari. If I'd had to choose just one, I would go with Magic Confetti, it's just so stunning! I'm still not sure though how I feel abot Mavala in general, at least I think they should finally update those bottles. They just look outdated to me and I don't like the cap. However, I don't mind the fact that these are smaller than regular polish bottles (only 5ml), it's quite perfect amount of glitter like this because I know I'm not using them that often no matter how pretty they are. I sure hope I won't be having problems opening these later on as that's something I know people struggle with these bottles. They get stuck and it's pretty impossible to open them. Hopefully that won't happen and I'll be able to do some holiday nail art with these pretties! Do you guys like this collection? Which one is your favorite? Mavalan Magic Stardust kokoelma tulee myyntiin marraskuun aikana ja ainakin joissain kaupoissa näitä on jo näkynyt. Mavalan 5 ml minilakan suositushinta on 5,20 euroa. Täytyy sanoa että näillä Mavala pääsi yllättämään, tässä on tosi monta ihanan näköistä lakkaa! Magic Spice on mun suosikki, ihana syksyglitter! Jep, hienoa työtä Mavalalta! :) Magic Spice on kyllä nimenomaan syksyinen glitter ja todella kaunis! Magic Sari nousee ehkä lemppariksi, joskaan en panisi pahakseni vaikka seassa on turkooseita glittereitä muutama enemmänkin. OMG!!! These glitter toppers is a must have! they have great colors that can match any nail color that you want. Will def gonna check on these!